Cyrus H. McCormick (1809-1884) was an industrialist and inventor of the first commercially successful reaper, a horse-drawn machine to harvest wheat. He was born at the family farm (Walnut Grove) in Rockbridge County, Virginia, on February 15, 1809. His father Robert experimented with a design for a mechanical reaper from around the time of Cyrus’ birth. In 1831 he abandoned the idea and turned the work over to his son. Cyrus made several changes to his father’s design and successfully demonstrated his reaper at Steele’s Tavern, Virginia, in July 1831. After a few additional modifications, he patented the invention in 1834. During the 1840s Cyrus and his family manufactured and sold reapers out of the blacksmith shop at Walnut Grove. Cyrus also made several trips to the Midwest, demonstrating his reaper and attempting to contract with local manufacturers. By the end of 1846, however, he had sold fewer than 100 machines. 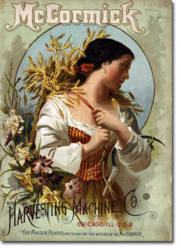 In 1847 he moved to Chicago and formed what eventually became known as the McCormick Harvesting Machine Company. There, McCormick developed innovative marketing and distribution techniques that helped make his company a success. He also benefited from the growth of Chicago as an industrial center and rail hub. By 1858 the company was the largest farm equipment manufacturer in the United States, with assets totaling more than 1 million dollars. In January 1858 McCormick married Nettie Fowler and began to spend more time away from Chicago. He also became more active in Presbyterian causes and Democratic politics. In 1859 he formed a partnership with his brothers William and Leander to form C.H. McCormick & Bros. William handled the company’s finances, and Leander oversaw manufacturing. In 1871 the company’s factory was completely destroyed in the Chicago Fire. McCormick built a new factory with increased capacity and began to pursue overseas markets in earnest. By the early 1880s, the company had expanded into markets as far away as Russia and New Zealand. Cyrus Hall McCormick died on May 13, 1884. His son, Cyrus Jr., became president of the McCormick Harvesting Machine Company. Throughout the 1880s and 1890s the company retained its position as the leading agricultural equipment manufacturer, however it found itself increasingly challenged by competitors in a somewhat depressed market. The company’s chief rival was the Deering Harvester Company. By 1900 McCormick and Deering were nearly equal in sales. In 1902 the two companies merged to form the International Harvester Company. Three other rivals joined the merger: the Plano Manufacturing Company, the Milwaukee Harvester Company, and Warder, Bushnell and Glessner. Cyrus McCormick’s sons, Cyrus, Jr. and Harold Fowler McCormick, presided over the new company during its first 40 years. In 1979, a new CEO came on board at IH, determined to improve profit margins and drastically cut a ballooning cost structure. 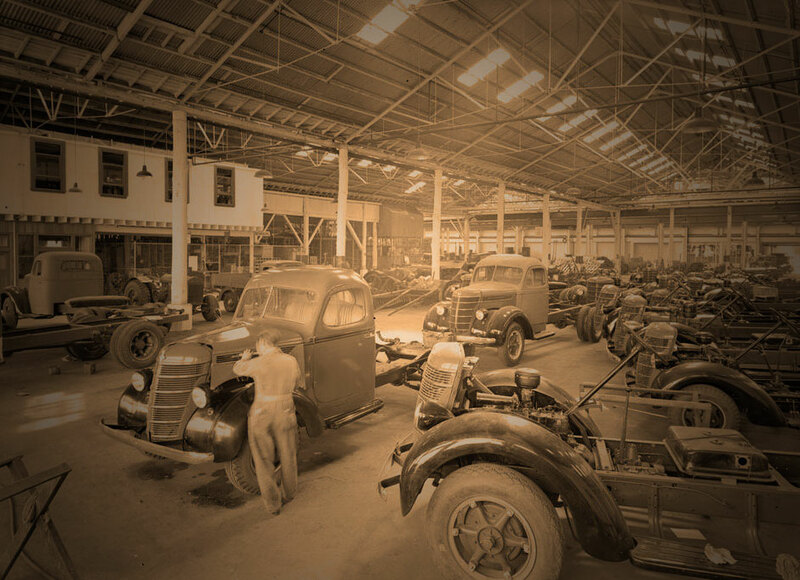 Unprofitable model lines were terminated, and factory production curtailed. By the end of the year, IH profits were at their highest in 10 years. Yet, the company was still strapped for cash, and union members became increasingly irate over production cutbacks and other cost-cutting measures. In the spring and summer of 1979, IH began short-term planning for a strike that seemed inevitable. Then on November 1, IH announced figures showing that president and chairman Archie McCardell received a US$1.8 million (in 1979 values) bonus. McCardell sought overtime, work rule, and other changes from the UAW, which led to a strike on November 2, 1979. Soon after, the economy turned unfavorably against IH, and they became entangled in a financial crisis. The strike lasted approximately six months. When it ended, IH had lost almost $600 million (in 1979 value; over $2 billion today). By 1981, the company was in trouble. The strike, accompanied by the economy and internal corporate problems, had placed IH in a hole that had only a slim way out. Things only got worse until 1984, when the bitter end came. Following the merger, tractor production at Harvester’s Rock Island, Illinois Farmall Works ceased in May 1985. Production of the new Case IH tractors moved to the J.I. Case Tractor Works in Racine, Wisconsin. Production of IH Axial-Flow combines continued at the East Moline, Illinois combine factory. Harvester’s Memphis Works in Memphis, Tennessee was closed and cotton picker production was moved. 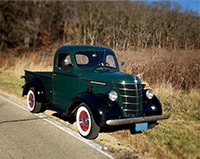 The truck and engine divisions remained, and in 1986 Harvester changed the corporate name to Navistar International Corporation (Harvester had sold the International Harvester name and the IH symbol to Tenneco Inc. as part of the sale of its Ag division). Navistar International Corporation continues to manufacture medium- and heavy-duty trucks, school buses, and engines under the International brand name.